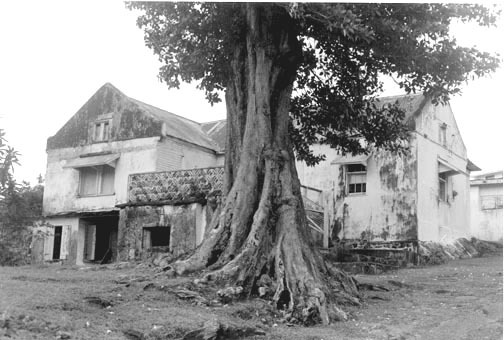 This is an OLD PICTURE, probably from the 50’s, of the COTTAGE at FORT CHARLOTTE that KING JAJA of OPOBO LIVED for a while. 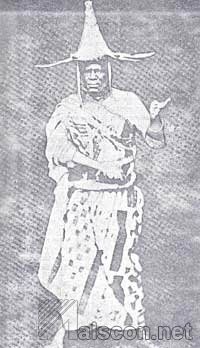 KING JAJA was the IGBO KING, from the REGION now called NIGERIA, who was EXILED by the BRITISH to MAINLAND St. Vincent in 1888. Source: Encyclopedia of World Biography, 2nd ed. 17 Vols. Gale Research, 1998. 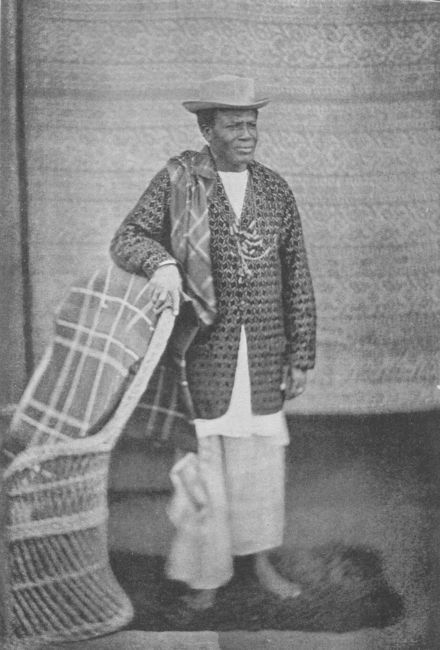 JaJa of Opobo (ca. 1820-1891) was a political and military strategist, brought to the Bonny Kingdom as a slave, who was perhaps the most troublesome thorn in the flesh of 19th-century British imperial ambition in southern Nigeria. The story of Ja Ja recounts a man of servile status hurdling intimidating odds to attain wealth and power, and founding in the latter half of the 19th century the most prosperous city-state in the Delta area of Nigeria. Information regarding his parentage and early childhood, derived from uncertain and speculative oral tradition, is scanty and unsatisfactory. According to informed guesstimates, Ja Ja was born in 1820 or 1821, in the lineage of Umuduruoha of Amaigbo village group in the heartland of Igboland, Southeastern Nigeria. He was sold into slavery in the Niger Delta under circumstances which are far from clear. One version of the oral traditions says that he was sold because, as a baby, he cut the upper teeth first, an abominable phenomenon in traditional Igbo society. Another version claims that he was captured and sold by his father’s enemy. Regardless, he was bought by Chief Iganipughuma Allison of Bonny, by far the most powerful city-state on the Atlantic coast of Southeastern Nigeria before the rise of Opobo. To follow the Ja Ja story or, indeed, revolution, an explanatory note is necessary. Until the end of the 19th century, the Delta communities played a crucial role in European and American trade with Nigeria. Acting as middlemen, these communities carried into the interior markets the trade goods of European and American supercargoes stationed on the coast and brought back in exchange the export produce of the hinterland, basically palm oil. As the Delta is dominated by saline swamps and crisscrossed by a labyrinth of creeks and rivers, the canoe was indispensable for trade. nsely competitive society, leadership by merit–not by birth or ascriptions–was necessary if a house was to make headway in the turbulent, cut-throat competition that existed between houses. Any person with the charisma and proven ability, even if of servile birth, could rise to the leadership of a house, but could never become king. Ja Ja would achieve this, and much more. Finding young Ja Ja too headstrong for his liking, Chief Allison made a gift of him to his friend, Madu, a chief of the Anna Pepple House, one of the two houses of the royal family (the other being the Manilla Pepple House). Ja Ja was slotted into the lowest rung of the Bonny slave society ladder, that of an imported slave, distinct from that of someone who was of slave parentage but born in the Delta. As a youth, he worked as a paddler on his owner’s great trade canoes, traveling to and from the inland markets. Quite early, he demonstrated exceptional abilities and business acumen, quickly identified with the Ijo custom of the Delta, and won the hearts of the local people as well as those of the European supercargoes. It was unusual for a slave of his status to make the transition from canoe paddling to trading, but Ja Ja–through his honesty, business sense, and amiability–soon became prosperous. For a long while, Ja Ja turned his back on Bonny politics, concentrating his immense energies on accumulating wealth through trade, the single most important criterion to power in the Delta. At the time, Bonny politics were volatile as a result of the irreconcilable and acrimonious contest for supremacy between the Manilla Pepple House and the Anna Pepple House to which Ja Ja belonged. Coincidentally, both houses were led by remarkable characters of Igbo slave origins–Oko Jumbo of the Manilla House and Madu (after him Alali his son) of the Anna House. In 1863, Alali died, bequeathing to his house a frightening debt of between £10,000 and £15,000 owed to European supercargoes. Fearing bankruptcy, all of the eligible chiefs of the house declined nomination to head it. It was therefore a great relief when Ja Ja accepted to fill the void. With characteristic energy, he proceeded to put his house in order by reorganizing its finances. Conscious that the palm-oil markets in the hinterland and the wealth of the European trading community on the coast constituted the pivot of the Delta economy, he ingratiated himself with both sides. In a matter of two years, he had liquidated the debt left behind by his predecessor and launched his house on the path of prosperity. When less prosperous and insolvent houses sought incorporation into the Anna House, Ja Ja gradually absorbed one house after another. Burton’s words proved prophetic. Ja Ja’s successes incurred the jealousy of opponents who feared that, if left unchecked, his house might incorporate most of the houses in Bonny and thereby dominate its political and economic arena. Oko Jumbo, his bitterest opponent, was determined that such a prospect would never materialize. Meanwhile, two developments occurred in Bonny, serving to harden existing jealousies. First, in 1864, Christianity was introduced into the city-state, further polarizing the society. While the Manilla House welcomed the Christians with a warm embrace, the Anna House was opposed to the exotic religion. Not surprisingly, the missionaries sided with the Manilla House against the Anna House. Second, in 1865, King William Pepple died and, with this, the contest for the throne between the two royal houses took on a monstrous posture. On September 13, 1869, heavy fighting erupted between the two royal houses. Outmatched in men and armament, though not in strategy, Ja Ja pulled out of Bonny, accepted defeat, and sued for peace with a suddenness that surprised both his adversaries and the European supercargoes. Peace palaver commenced and dragged on for weeks under the auspices of the British consul. This was exactly what Ja Ja planned for. It soon became doubtful if the victors were not indeed the vanquished. Ja Ja had sued for peace in order to gain time to retreat from Bonny with his supporters with little or no loss in men and armament. A master strategist, he relocated in the Andoni country away from the seaboard at a strategic point at the mouth of the Imo river, the highway of trade between the coastal communities and the palm-oil rich Kwa Iboe and Igbo country. There, he survived the initial problems of a virgin settlement as well as incessant attacks of his Bonny enemies. [I]t is characteristic of the man that he had not only a sense of the occasion but of history. . . . Kingship was impossible of attainment for anyone of slave origins in Bonny. Instead he sought another land where he could give full scope to his boundless energies. Long before the war of 1869, Ja Ja had been carefully planning to found his own state. The war merely provided him with the occasion to implement his design. In naming his new territory Opobo, Ja Ja was appealing to the nostalgia and historical consciousness of his followers while giving them the impression that he was truly the heir of the celebrated king. That this impression was widespread and accepted by most Bonny citizens may be judged from the fact that of the 18 houses in Bonny, 14 followed Ja Ja to Opobo. For 18 years, Ja Ja ruled his kingdom with firmness and remarkable sagacity. He strengthened his relations with the hinterland palm-oil producers through judicious marriages and blood covenants which bound the parties into ritual kingship. He armed his traders with modern weapons for their own defense and that of the state. He thus monopolized trade with the palm-oil producers and punished severely any community that tried to trade directly with the European supercargoes. In 1873, the British recognized him as king of independent Opobo, and Ja Ja reciprocated by sending a contingent of his soldiers to help the British in their war against the Ashanti kingdom in the Gold Coast (now Ghana). Queen Victoria expressed her gratitude in 1875 by awarding him a sword of honor. It seemed a honeymoon had developed between Opobo and Britain. Ja Ja’s reign has been described as a striking instance of selective modernization. He retained most of the sociopolitical and cultural institutions of Bonny, such as the house system, and stuck steadfastly to the religion of his fathers, arguing that Christianity was a serious ferment of societal destabilization. While recognizing the value of Western education and literacy, he objected to its religious component. Thus, he sent his two sons to school in Scotland but insisted they acquire only secular education. He established a secular school in Opobo and employed an African-American, Emma White, to run it. An Englishman who visited Opobo in 1885 stated that the standard of the pupils in the school compared quite favorably with that of English children of the same age. The honeymoon between Ja Ja and the British turned out to be meteoric: the ultimate ambitions of the two ran at cross-purposes. Ja Ja guarded his independence jealously, had a tight grip on the interior markets and confined British traders to Opobo, away from these markets. He made sure that the traders paid their comeys (customs and trade duties) as and when due. But in the 1880s, the clouds of British imperialism were closing in menacingly on Opobo, the overthrow of indigenous sovereignties having been initiated by John Beecroft, the first British consul to Nigeria (1849-54). British imperialism had begun to assert itself forcefully; British officials on the spot were increasingly ignoring indigenous authorities, while British traders had begun to insist on trading directly with the hinterland palm-oil producers. Ja Ja tackled these formidable problems judiciously and with restraint. the queen does not want to take your country or your markets, but at the same time she is anxious that no other nation should take them. She undertakes . . . [to] leave your country still under your government; she has no wish to disturb your rule. At Ja Ja’s insistence, a clause providing for free trade in his kingdom was struck off before he agreed to sign the treaty. The following year, European powers entered into the Treaty of Berlin which set the stage for the scramble and partition of Africa among themselves, without regard to the wishes of Africans. The treaty provided for free navigation on River Niger and other rivers, such as the Imo, linked to it. On the basis of this, the British consul asserted that British firms were within their rights to trade directly in the interior palm-oil markets. That same year, 1885, Britain proclaimed the Oil Rivers Protectorate, which included Ja Ja’s territory. Sending a delegation to the British secretary of states for the colonies to protest these actions by right of the treaty of 1884, Ja Ja’s protest fell on deaf ears. A man of his word, he was shocked at Britain reneging on her pledge. Worse times were yet to come as political problems were compounded by economic dispute. The 1880s witnessed a severe trade depression that ruined some of the European firms trading in the Delta and threatened the survival of others. The surviving firms responded to the situation in two ways. First, they reached an agreement among themselves, though not with complete unanimity, to offer low prices for produce. Second, they claimed the right to go directly to the interior markets in order to sidestep the coastal middlemen and reduce the handling cost of produce. As would be expected, Ja Ja objected to these maneuvers and proceeded to ship his own produce directly to Europe. The British consul directed the European firms not to pay comey to Ja Ja anymore, arguing that in shipping his produce directly to Europe, he had forfeited his right to receive the payment. Once again, Ja Ja sent a delegation to Britain to protest the consul and the traders’ action. Once again, this was to no avail. I hereby assure you that whether you accept or reject my proposals tomorrow, no restrictions will be put on you–you will be free to go as soon as you have heard my message. But again the British reneged on their pledge: Ja Ja would not return to his kingdom alive. Once on board the warship Goshawk, Johnston confronted him with a deportation order or the complete destruction of Opobo. Nearly 18 years to the day when he pulled out of Bonny, Ja Ja was deported to the Gold Coast, tried, and declared guilty of actions inimical to Britain’s interest. Still afraid of his charm and influence on the Gold Coast, even in captivity, Johnston saw to it that he was deported to the West Indies, at St. Vincent Island. With the exit of Ja Ja, the most formidable obstacle to Britain’s imperial ambition in Southeastern Nigeria had been removed. But the circumstances of his removal left a sour taste in certain British mouths. Lord Salisbury, British prime minister, could not help criticizing Johnston, noting that in other places Ja Ja’s deportation would be called “kidnapping.” Michael Crowder describes the event as “one of the shabbiest incidents in the history of Britain’s relations with West Africa.” Among the indigenous population, it left a deep and lasting scar of suspicion of Britain’s good faith and, for a long time, trade in the area all but ceased. In exile, Ja Ja is said to have borne himself with kingly dignity. He made repeated appeals to Britain to allow him to return to Opobo. In 1891, his request was granted, belatedly as it turned out: Ja Ja died on the Island of Teneriffe en route to Opobo, the kingdom built with his sweat and devotion. His people gladly paid the cost of repatriating his body and spent a fortune celebrating his royal funeral. A king in title and in deed. Always just and generous. Burn, Alarn. History of Nigeria. George Allen & Unwin, 1929. Dike, Kenneth O. Trade and Politics in the Niger Delta, 1830-1885. Oxford University Press, 1956. Isichei, Elizabeth. A History of the Igbo People. Macmillan, 1976. Ogonagoro, Walter I. Trade and Imperialism in Southern Nigeria, 1881-1929. Nok Publishers, 1979. Previous PostGill Nobles interviews Bob Marley (Video)Next PostWas Phoenician sport the foundation of the Olympic Games?